The GSA SmartPay Program is the world’s largest commercial payment solution program, providing services to more than 560 Federal agencies, organizations and Native American tribal governments. The GSA Center for Charge Card Management (CCCM) and GSA SmartPay contractor banks are dedicated to identifying opportunities to provide customers with GSA SmartPay solutions to help address agency payment challenges. CCCM seeks to increase awareness of available payment solutions under the GSA SmartPay master contract and help agencies continue to find ways to increase payment efficiencies and earn refunds. In the current budgetary environment, CCCM is committed to providing information to agency executives and card managers to identify innovative ways to help realize cost savings. Established in 1998, the GSA SmartPay Program is the world’s largest government charge card and commercial payment solutions program, providing services to more than 560 Federal agencies, organizations, and Native American tribal governments. GSA SmartPay payment solutions enable authorized government employees to make purchases on behalf of the Federal Government in support of their agency/organization’s mission. Prior to using a GSA SmartPay payment solution, the Federal Government used traditional paper-based payment processes such as purchase orders for small dollar purchases (under the micro-purchase threshold). In many cases, traditional paper-based processing techniques cost more to process than the amount of the transaction itself. The inefficiency, costs and risks associated with these processes were a key factor in the dramatic increase in the use of GSA SmartPay payment solutions. Provide a more efficient and effective means to monitor transactions and identify fraud, waste, and abuse. Cost Savings Realized: Customers have the opportunity to realize administrative cost savings through payment efficiencies. The estimated administrative savings for the purchase card alone is $1.7 billion per year ($70 per transaction) when used in place of a written purchase order. Agencies also pay no direct fees and features include automated account reconciliation, spend audits, and data mining options, which are compliant with P.L. 112-194 data mining requirements. Agency Refunds: Agencies have the opportunity to earn refunds based on the dollar volume of transactions and the speed of payment. Since the program’s inception in 1998, customers have earned more than $3 billion in net refunds for mission support. In Fiscal Year 2012 alone, net government refunds totaled $306 million. Safety and Transparency: The GSA SmartPay Program provides secure solutions for efficient payment transactions. Customers also have access to tools that promote increased transparency through access to spend and performance data. Electronic Access to Data: Through GSA SmartPay contractor bank online systems, account managers and account holders have immediate access to complete transaction-level data, helping to mitigate fraud, waste, and abuse. Worldwide Acceptance: Through the use of commercial payment infrastructure, customers are able to use GSA SmartPay solutions anywhere in the world where merchants accept cards. Identification for Discount Programs: GSA SmartPay solutions provide automatic point-of-sale recognition for many GSA discount programs, including Federal Strategic Sourcing Initiative programs, the GSA City Pair Program, and more. A GSA SmartPay travel payment solution is required to obtain airfare discounts through the GSA City Pair program, creating billions in annual savings governmentwide. Other Benefits: GSA SmartPay payment solutions provide other less tangible benefits including travel insurance and eliminating the need for imprest funds or petty cash at the agency. Approving Official (AO) is typically the account holder’s supervisor and assures proper use of the purchase account. He/she determines if purchases are necessary for accomplishing the mission of your agency. Using the account ethically for official Government travel only. Transaction Dispute Officer (TDO) is an individual or office that may be designated by the ordering agency/ organization to assist the agency/ organization and the bank in tracking and resolving disputed transactions. The TDO oversees the proper processing of transaction disputes and works with the bank to assure their resolution. EC/EDI Office (EO) is the focal point for electronic commerce/ electronic data interchange (EC/EDI) for the agency/organization. The EO oversees the proper implementation of the agency/organization EC/EDI capabilities and processes. Merchant is the source for your supplies or services. Merchants may be a required source inside or outside the Government, another government agency, or a private sector merchant of supplies or services. The General Services Administration's (GSA) SmartPay Program provides agencies and other organizations with a comprehensive portfolio of purchase, travel, fleet, and integrated payment solutions. Through a master contract with multiple banks, the GSA SmartPay program enables agencies/ organizations across the Federal Government to obtain payment solutions to support mission needs. Agencies/ Organizations issue a task order under the GSA SmartPay master contracts and award their program to one of the GSA SmartPay contractor banks. The banks provide payment solutions to the agency/ organization employees to make purchases on behalf of their agency/organization. The GSA SmartPay Program offers four business lines of payment solutions including: Purchase, Travel, Fleet, and Integrated. These innovative payment solutions can be customized for enhancing internal controls and increasing range of payments eligible to earn refunds, while improving vendor cash flow. Depending on the type of payment solution and agency/organization, there may be different requirements for applicants to participate in the program. Purchase: In order to obtain a purchase account, an employee must be recommended by their supervisor to apply through their program coordinator. Potential purchase account holders MUST complete purchase account holder training before using the purchase account. Travel: Depending on the frequency of travel, agency or governmentwide policy may require that an employee obtains a government travel account to make travel related purchases. Travel account applicants may be subject to a creditworthiness check and MUST complete training before using the travel account. Fleet: Fleet payment solutions are generally assigned to a vehicle, rather than an individual. Users of a government vehicle should contact their fleet program manager to learn more about their agency's fleet policy. 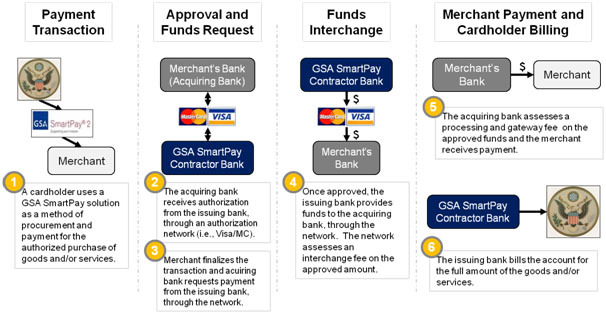 Below is an illustration of how a GSA SmartPay transaction works, highlighting stakeholders involved and efficiency of payment through the program. In addition to saving money by paying no direct fees for using GSA SmartPay solutions, customer agencies and organizations have the opportunity to earn refunds. Refunds earned can and have been used by customer agencies to directly fund and support efforts critical to their mission. An agency’s refund rate range has been established by the GSA SmartPay master contract in which the minimum refunds are a single rate that considers both volume of spend and speed of pay historically found under the GSA SmartPay Program. Minimums may vary by CLIN and business line. An agency and the GSA SmartPay contractor bank can negotiate additional refund incentives and document it in the task order. Agencies can maximize refunds earned by migrating spend from convenience checks, personal payment (e.g., cash or personal credit card), and traditional contract payment to GSA SmartPay payment solutions. Corrective Refunds: Payments from the Contractor to the agency/organization to correct improper or erroneous refund payments, or an invoice adjustment. Net Refunds: Payments from the Contractor to the agency/organization based on the dollar or “spend” volume during each reporting period. Generally, refunds are remitted quarterly and align with the Federal Government’s Fiscal Year quarters. There are three steps to calculating a customer agency’s Net Refunds. Determine Net Charge Volume by adding purchases, cash advances, convenience checks, and fees then subtracting adjustments and credits. Determine Refund Eligible Net Charge Volume by subtracting convenience check spend and gross credit losses from the Net Charge Volume. Calculate Net Refunds by adding gross refund to Refund Eligible Net Charge Volume and subtracting the GSA Contract Access fee. Example refund calculations can be found in section B.3.3 of the SmartPay 3 Master Contract. Please visit our Glossary page for Master Contract definitions of terms found in steps 1-3. In 2018, GSA contracted with two banks to provide purchase, travel, fleet and integrated payment solutions. Collectively these contracts are known as the GSA SmartPay 3 Master Contract. The current master contract is the 2018 GSA SmartPay 3 Master Contract. Beginning November 30, 2018, GSA transitioned to the new GSA SmartPay 3 Master Contract. Eligibility for the program is determined by the GSA SmartPay Contracting Officer. Federal agencies, departments, tribal organizations, and approved non-federal entities to include those eligible to use GSA sources of supply and/or cost-reimbursable contractors, can apply to obtain charge payment solution services under the GSA SmartPay program. Fleet: This payment solution allows for the fueling and maintenance of vehicles, boats, planes or equipment efficiently and provides for management information reports to track fleet expenditures. Travel: This payment solution allows for the purchase of common carrier transportation, car rentals, lodging and meals for official travel and travel-related expenses. Check for eligibility to participate in GSA's City Pair Program for discounted government airfares. Also, management reports help manage travel expenses. Purchase: This payment solution will enable day-to-day business purchases necessary to run an organization. Use the information contained in the management information reports to negotiate better discounts from preferred merchants. In order to participate in the GSA SmartPay program, the first step is to fill out and submit the below GSA SmartPay program application. Once the application is approved, it will be necessary to select the vendor and platform that best meets organizational needs and to issue a task order to the selected vendor. Tag-along with an existing task order. Those tribes or tribal organizations interested in meeting their immediate need with minimal resources, may wish to give serious consideration to the tag-along option. Tagging with existing task orders provides eligibility for the same negotiated prices and saves time and resources. GSA offers assistance with preparing applications or task orders at no additional cost. At this time, state and local governments are not authorized to utilize the GSA SmartPay contract. However, state and local governments are welcome to review the GSA SmartPay program offerings and best practices to serve as a guideline for similar payment programs. The current GSA SmartPay® 2 Master Contracts expires on November 29, 2018. The future program is referred to as GSA SmartPay 3 or “SP3”. Citibank and U.S. Bank were awarded contracts for GSA SmartPay3. The Center for Charge Card Management would like to pass along some tips to consider when developing your GSA SmartPay 3 (SP3) Task Order (TO) level requirements. Tip 1: Familiarize yourself with the SP3 Transition Documents. These documents include the Needs Assessment Tool, TO Type Tool, TO Guide, Frequently Asked Questions (FAQs), "Choose Your Brand" video, and an A/OPC Information Technology (IT) Quick Reference, among others. Tip 2: Familiarize yourself with the SP3 Master Contract and review the Master Contract Updates Quick Sheet. Many Tier 2 product / services found in SmartPay 2 (SP2) are now included as Tier 1 products / services under SP3. Sections C.3.1.1 and C.3.1.2 of the master contracts detail which products / services fall under each tier. Bump TO level requirements up against these sections to ensure products and services are classified correctly in your TO. Tip 3: Avoid restating master contract requirements in the TO level documents. Instead cross reference to the master contract requirements by section, as needed. Tip 4: Use definitions and terminology found in the master contract. Using terminology and definitions inconsistent with the master contract can result in misunderstandings during contract performance. If your agency uses another term for an SP3 product / service, please be sure to cross reference the meaning to the appropriate SP3 term. Tip 5: Fair Opportunity. All TO requirements should be written such that any SP3 master contract holder can understand and propose on the requirements. This falls under "Fair Opportunity" as defined by the Federal Acquisition Regulation (FAR) Subpart 16.505(b)(2) and as found in Section H.12.1 of the master contract. To assist with the transition process, the Center for Charge Card Management is offering a variety of tools located under Resources. Please use contact information found in the SP3 presentation packages to reach SP3 contractors about their product and service offerings. Virtual training is offered to all Level 1 (DoD Level 2) Program Coordinators on our GSA SmartPay Training Website. Note: You must have prior approval to access this training and be registered as a Level 1 A/OPC. For any additional questions, please contact us at gsa_smartpay@gsa.gov. The GSA SmartPay program provides statistical summary information and monthly reporting on spend, transactions, and the number of account holders, including specific information about each business line. Find out more about agency refunds and the impact of transferring additional types of spend to the GSA SmartPay program. The total spend for FY18 was up from FY17 and totaled $30.6B. Agencies/ Organizations received $310.2 million in refunds. Each GSA SmartPay account holder, on average, spent approximately $320 per transaction. The Department of Veterans Affairs was the top agency by program spend with $11 Billion. The following program data is provided for informational purposes only and should not be used to calculate agency refunds, basis points or usage of GSA SmartPay payment solutions by agency personnel. Data herein has been provided by the respective banks and is subject to verification as to accuracy. Please contact the GSA SmartPay Program Support for questions. When using the Program Statistics please save the file to your system, open the file, and enable Macros, so the file works as designed. Sales, Transactions, and Account Holder Data (FY 2009 - November 2018) - Spreadsheets containing current statistics for GSA SmartPay Purchase, Travel and Fleet. Note: A number of people have reached out and asked questions on the usage of the tool and the data behind it. The questions have been repeatedly asked and their related answers are now contained in the "Frequently Asked Questions" or FAQ sheet. Fiscal Years 1999-2009 Card Sales, Transactions and Account Holder Data - Spreadsheets containing fiscal years 1999-2009 data and statistics for GSA SmartPay Purchase, Travel and Fleet. Fiscal Year 2018 Program Fact Sheet - The GSA SmartPay program at a glance. The GSA SmartPay program generates performance-based refunds for agencies/organizations. In fiscal year (FY) 2018 agencies/organizations received over $310.2 million in refunds. Why are refunds allowable under the GSA SmartPay master contracts? Unless an agency has specific statutory authority to handle funds received, 31 U.S.C. § 3302 states that incoming funds deposited into the Treasury general fund. The exception to this rule is when funds qualify as "refunds" which are defined as repayments for excess payments." Or, refunds can be defined as "amounts collected from outside sources for payments made in error, overpayments or adjustments for previous amounts disbursed." Under either definition, these "refunds" must go back to the appropriation or fund account(s) from which the excess payment were made. Sources: Rebates from Travel Management Center Contractors, B-217913, 65 Comp. Gen. 600; May 30, 1986; Accounting for Rebates from Travel Management Center Contractors, B-217913.3, 73 Comp. Gen. 210, June 24, 1994. GSA originally looked into the use of refunds as part of its TMC contracts and the Comptroller General found that if the TMC contractor agreed to discount its services to the Government, GAO saw no reason why the agency should not be authorized to deposit this saving to the credit of the appropriation against which the initial cost of the employee travel was charged since these receipts are actually a return of a portion of a prior agency payment and may be deposited to the credit of the appropriation against which the payment was initially charged rather than to a general fund receipt account. If the appropriation initially charged has not expired, the refund is available to support new obligations. If the appropriation account initially charged has expired, but has not yet closed, the refund is deposited to the credit of the expired account where it is available for recording or adjusting obligations properly incurred before the appropriation expired. Sources: 71 Comp. Gen. 502 (1992); B-217913.2, Feb. 19, 1993; GAO, Policy and Procedures Manual for Guidance of Federal Agencies, title 7, §§ 4.3, 5.4 ; 31 U.S.C. § 1552(b). This same analysis and reasoning was applied to the GSA SmartPay program with respect to refunds. Refunds under the GSA SmartPay program are discounts offered by the banks, which may be deposited to the credit of the appropriation against which the initial cost was charged. If that appropriation has expired, but not yet closed, the refund may be credited to the expired account where available. If the appropriation has expired, and the expired account has been closed, the refund would be properly credited to the appropriate Treasury general fund. The exception permitting the deposit of refunds to the appropriation initially charged is permissive in nature. If an agency declines the refund, it should be deposited to the Treasury general fund. The top 5 US Cities make up 10% of the total travel spend from FY2010 - FY2018. Types of spend include lodging, rental cars, meals and incidental travel-related expenses. Note: Airline expenditures are not included. Convenience checks are a payment and/or procurement tool intended only for the use with merchants that do not accept the GSA SmartPay Purchase Account. While convenience checks are sometimes needed they should be the last source of payment when possible. Convenience checks have additional fees associated with them and don't qualify for refunds, costing the Government more than a traditional purchase account. In 2010 GSA SmartPay sent out the GSA SmartPay Bulletin No. 012 to encourage agencies to reduce the convenience check usage by 5% each fiscal year. This chart outlines the success in convenience check reduction over the past 7 years with an annual reduction between 11-19%. The GSA SmartPay Chip Card Transactions Chart shows the number of transactions of all business lines (travel, purchase, fleet) for each calendar year (CY) within the GSA SmartPay Program. As you can see from the chart below, chip card transactions are steadily increasing from just over 500,000 in 2015 to over 5 Million in 2017. The GSA SmartPay Chip CardSpend Chart shows the annual breakdown of the chip card spend of all business lines (purchase, travel, fleet) of Calendar Year (CY) 2015, 2016, 2017, and 2018. The chart shows chip card spend has significantly increased from $871.3M in CY2017 to $1.2B in CY2018 (through October). The Top Domestic Chip Card Merchants Chart shows the chip card spend for the top merchants for all business lines for Calendar Year (CY) 2018. The chart demonstrates the total dollar amount of the top merchants is just over 6% of the total chip card spend for CY2018. Travel Account Delinquency Rates Individually Billed Account (IBA) -The percent of travel card balances outstanding over 61 days for Individually Billed Accounts (IBA). Travel Account Delinquency Rates Centrally Billed Account (CBA) - The percent of travel card balances outstanding over 61 days for Centrally Billed Accounts (CBA). Below is a list of the top vendors based on spend within the GSA SmartPay travel program by fiscal year. The Top Travel Vendor Report includes travel charges for Airline, Rental Car, Hotel, Cash Advances, and other Travel related charges. Restaurant/Meal charges are not included in the report. FAR 4.606(a)(2) requires the GSA Center for Charge Card Management (CCCM) to provide summary Government-wide purchase account data on an annual basis. CCCM therefore has developed the GSA SmartPay® Purchase Card Statistics Report for this purpose. A new report will be added at the end of each fiscal year. This report provides the aggregate GSA SmartPay spend for government-wide for the various socioeconomic categories, e.g., Women-Owned Small Business, Veteran-Owned Small Business, etc. The report breaks out the spend at and below the Micro-Purchase Threshold (MPT) as well as spend above the MPT. The report also provides the overall percentage of GSA SmartPay spend on small businesses relative to the total purchase card spend under the program. This socioeconomic data is industry data which leverages the available commercial charge card platform; as such it may not confirm to the specific Small Business Administration (SBA) standards. This section discusses relevant legislation and regulations of the GSA SmartPay program. However, policies will vary from agency to agency, based on mission considerations. It is recommended that you are familiar with your specific agency policies and how they relate to your role in the GSA SmartPay program. Appendix B of OMB Circular A-123 prescribes policies and procedures to agencies regarding how to maintain internal controls that reduce the risk of fraud, waste, and error in government payment solution programs. Best practices in managing government charge card programs. Increases oversight by requiring that each agency Inspector General (IG) periodically conduct risk assessments and audits to identify fraud and improper use of the government payment solutions. (b) AGENCY REPORTS AND CONSOLIDATED REPORT TO CONGRESS.—Not later than one year after the date of the enactment of this Act, the head of each Federal agency described in section 2 of the Government Charge Card Abuse Prevention Act of 2012 (Public Law 112–194) shall submit a report to the Director of the Office of Management and Budget on that agency’s activities to implement this title. OMB Memorandum M-13-21 directs agencies to use the “Compliance Summary Matrix” below to help ensure the required safeguards and internal controls are in place. The matrix details the internal control requirements stated in P.L. 112-194. Agencies are not required to submit the matrix to OMB. Agencies/organizations should review these requirements and compare them to existing internal controls within their implementation charge card program in order to document the operational effectiveness of current control activities. Instances of non-compliance should be documented as well as a summary of corrective actions to be taken to address shortcomings. Executive agencies should maintain this compliance summary on-file along with related supporting documentation, as evidence of adequate control assurances. This compliance summary should also be available for IG reviews. Agencies should summarize the overall results in their completed compliance summary and internal 3 control assurance assessments in their annual charge card management plans, beginning with their January 31, 2014 submission to OMB. Note that the compliance matrix is designed to assist agencies in employing an effective charge card internal control program which is in balance with the need to maintain card flexibility and ease of use in support of agency mission activities. As a result, compliance with individual matrix criteria in and of itself is not as important as the effectiveness of an agency’s charge card internal control program overall. The following chart provides information on all reporting requirements for agencies under OMB Circular A-123, Appendix B and Public Law 112-194, Charge Card Abuse Prevention Act. Note: OMB Memo M-17-26 removed the agency reporting requirement for the Statistical and Narrative Reports to OMB. However, agencies are still required to maintain statistical and narrative information for their own use and management of their charge card program. OMB is finalizing an update to Appendix B of OMB Circular A-123 (2009). This update will streamline reporting requirements and consolidate existing requirements in a central location. Beginning with fiscal year 2013, each agency with more than $10 million in purchase card spending the prior fiscal year is required to submit sem-annual reports of employee purchase or integrated card violations and the disposition of these violations, including disciplinary actions taken. Consistent with Section 6 of the Charge Card Act, the semi-annual reports shall not disclose personally-identifying information protected from disclosure under the Privacy Act of 1974 (5 U.S.C. 552a). A summary description of confirmed violations involving misuse of a purchase or integrated solution, following the completion of agency or IG review. A summary description of all adverse personnel actions, punishment, or other actions taken in response to each reportable violation involving misuse of a purchase or integrated solution. An administrative or internal control process inconsistency that does not result in fraud, loss to the Government, or misappropriation of funds or assets (whether or not recouped) is not a reportable violation for purposes of the semi-annual report. The semi-annual Joint Purchase and Integrated Card Violation Report is to be prepared by the agency head and the IG for submission to OMB 120 days after the end of the reporting periods (i.e., April1 to September 30 and October 1 to March 30), beginning with the January 31, 2014 submission. The submission should be incorporated into the existing Charge Card Management Plans, which are also due to OMB on January 31,2014. The second semiannual report is due on July 31,2014. Any additional useful information regarding charge card programs. Government Charge Card Reporting pursuant to Appendix B of OMB Circular A-123 – Chapter 5 of Appendix B to OMB Circular A-123 (2009) on “Statistical Reporting” in section 5.3.1 and “Narrative Reporting” in section 5.3.2 are now optional and not required to be submitted to OMB. Agencies are still required to maintain statistical and narrative information for their own use and management of their charge card program. OMB is finalizing an update to Appendix B of OMB Circular A-123 (2009). This update will streamline reporting requirements and consolidate existing requirements in a central location. In addition, agencies are still required to report purchase card violations pursuant to OMB Memorandum M-13-21 (Implementation of the Government Charge Card Abuse Prevention Act of 2012). The Federal Acquisition Regulation (FAR) is the principal set of rules in the Federal Acquisition Regulation System. This system consists of sets of regulations issued by Federal agencies to govern the acquisition process. That process consists of three phases: (1) need recognition and acquisition planning, (2) contract formation, and (3) contract administration. The purpose of the FAR is to provide "uniform policies and procedures for acquisition." FAR 1.101. Among its guiding principles is to have an acquisition system that (1) satisfies customer's needs in terms of cost, quality, and timeliness; (2) minimizes administrative operating costs; (3) conducts business with integrity, fairness, and openness; and (4) fulfills other public policy objectives. FAR 1.102(b). FTR Amendment 2016-01 included updates to ensure that the Government contractor-issued travel charge card is used as often as practicable. In addition, it strengthens card issuance and use policies and provides the agency head/designee with waiver authority. Per diem rates—the allowance for lodging (excluding taxes), meals, and related incidental expenses—are regularly reviewed and adjusted according to market conditions. GSA establishes per diem rates for destinations within the continental United States (CONUS). Links to foreign rates, established by the State Department, and non-foreign (other than CONUS) rates, set by the Department of Defense, are provided below the interactive map. Below are public laws and sources for public laws related to the GSA SmartPay program. S. 1616 increases oversight of federal agencies’ use of the purchase and travel accounts. The legislation establishes an Office of Federal Charge Card Analytics and Review within the Government Services Administration (GSA) to examine purchases made using federal charge cards. Under S. 1616, GSA also would establish an interagency task force to facilitate the sharing of information and to promote best practices to reduce fraud and improper payments. Finally, S. 1616 would require GSA to report to the Congress on the effectiveness of those efforts. Based on information from GSA regarding the current government charge card program, CBO estimates that implementing S.1616 would cost $65 million over the 2016-2020 period, assuming appropriation of the necessary amounts. Enacting S.1616 would not affect direct spending or revenues; therefore, pay-as-you-go procedures do not apply. Requires the head of each federal agency to report information on travel and transportation expenditures, relocation expenditures, and number of trips for official Government travel. This information is reported to the Administrator of the General Services Administration and must be approved by the Director of the Office of Management and Budget. Note: GSA FTR bulletin 16-05 dated July 27, 2016 also addresses this issue. Government customers can use GSA SmartPay payment solutions to purchase and/or pay for official American Recovery and Reinvestment Act (ARRA) requirements. The use of official U.S. government payment solutions enhances reporting and transparency while adhering to Recovery Act requirements. Accounts must be used in accordance with OMB Circular A-123, Appendix B and in conjunction with any additional agency policies. The three GSA SmartPay contractor banks offer robust services to support your agency as you spend your ARRA funds. If you anticipate a high volume of Recovery Act-related transactions, banks can create additional accounts and link them to specific Recovery Act accounting codes, improving reporting capabilities and oversight. Transaction, reconciliation, and reporting procedures are the same as standard procedures and may reduce administrative costs. Additionally, your agency will continue to receive refunds from the contractor bank based on agency spending through the program. You can find specific guidance on card use and reporting requirements for purchases above and below the micro-purchase threshold within OMB Memo M-09-15. To get started, refer to the OMB memo and discuss options within your agency on how charge cards and your GSA SmartPay bank can help you meet ARRA requirements. Obtain additional information by contacting GSA SmartPay Program Support at (703) 605-2808 or email gsa_smartpay@gsa.gov. Welcome to GSA SmartTax information! Find information and materials to help understand state tax issues and how they impact agency mission and operations. Click on the US State Tax Map to find specific state tax information including when you are required to pay taxes and when you are exempt. Click here to watch a short video on the importance of SmartTax. Click on the link in the US State Tax Map to select your state/US territory of interest below to see the exemption status, view key points of contact for each state and to download the appropriate form, if required. The GSA SmartTax is a communications campaign that provides a unified message about state tax requirements, leading practices, and lessons learned. The goal of messaging is to target stakeholders at critical decision points (e.g., the point of sale) and to help federal government employees and vendors understand when it is appropriate to assess state tax on a GSA SmartPay account, and when it is not. The GSA SmartTax campaign also aligns with Executive Order 13589 Promoting Efficient Spending, issued on November 9, 2011. Through a better understanding of the state tax issues, agency/organizations may better preserve budgets for mission critical activities. What does the U.S. Constitution Say? CBAs (centrally billed accounts) include purchases paid directly by the government and are not charged tax. CBA cards are issued at the agency, bureau, division, or fleet level, rather than to individuals. The credit limit is determined based on an agency's mission and charge card spend policies. The Federal government agency is billed directly for the purchase of goods and services. IBAs (individually billed accounts) include travel expenses paid by the employee who later seeks reimbursement from the government and allow for taxes to be charged. Authorized Federal government employees are issued IBA cards after a personal credit score assessment, and the credit limit is determined by the agency and agency travel and card policies. The cardholder (and not the government) is billed for the purchase of goods and services. When it comes to federal employees who travel on government business, states have taken two approaches to the matter of applying tax. Most states require hotels and restaurants collect taxes from employees who use an IBA charge card for payment. The legal reasoning is that it is the employee, not the federal government, who is liable for the card and charges made on it. The legal incidence of the tax falls on the employee (indeed, the entire bill is the personal responsibility of the employee), and the transaction is taxable. Alabama v. King & Boozer, 314 U.S. 1 (1941) - The US Supreme Court specifically addresses the legal vs. economic incidence of a tax. The Court said that a state sales tax on materials purchased by a contractor under a federal contract is not a direct tax on the federal government, even though the government has obligated itself by a contract to bear the economic burden of the tax. Specifically, the court said that the fact that the economic incidence of a tax might fall on the Federal government "is but a normal incident of the organization within the same territory of two independent taxing authorities." U.S. v. New Mexico, 455 U.S. 720 (1982) - A contractor made purchases on behalf of the federal government and was reimbursed. The U.S. Supreme Court upheld the state's use (sales) tax imposed on the purchase. The court said the Federal contractor was an independent entity whose limited relationship with the government was defined by the parameters of the contract between them. States collect taxes on purchases through merchants and vendors in those states. This means the taxes will go to the state but the merchants and vendors act as the tax collection point and determine when to assess tax and when not to. What is the GSA SmartPay Travel Account? The GSA SmartPay Travel Account can be used for official government travel and travel-related expenses, while allowing account holders access to GSA City Pair Program reduced airfares. Agency/organizations are able to reduce travel processing costs and earn refunds as annual spend has nearly tripled since the program’s inception in 1998. GSA SmartPay Travel Account revenue funds the GSA City Pair reduced cost airline ticket program. Some states provide tax exemption on individually billed travel accounts (IBAs). To determine whether the travel or integrated account is a CBA, IBA, or Tax Advantage Travel Account, refer to the 6th digit of the account number. Federal government travelers using IBA GSA SmartPay Travel Accounts may be exempt from state taxes in select states. In addition, state tax exemption forms, official business travel documentation or a Federal Government ID may be required to receive state tax exemption. Find out the details for each state by clicking here. Visit the US State Tax Map to determine if the state you are traveling to exempts taxes. In accordance with the Travel and Transportation Reform Act of 1998 (PL 105-264), please use the GSA SmartPay Travel Account when you are on official federal government travel. States will not exempt taxes on personal accounts and your agency will not have the ability to earn important refunds. In accordance with the Federal Acquisition Regulation, the GSA SmartPay Purchase Account is the preferred method to purchase and pay for micro-purchases (FAR Part 13.201). For purchases above the micro-purchase threshold, the Purchase Account may be used as an ordering and payment mechanism, but not as a contracting mechanism. All GSA SmartPay Purchase Accounts are centrally billed (CBA) and should be exempt from State taxes. Find out the details for each state by clicking here. If a vendor does not accept the GSA SmartPay Purchase Account, work with your program or program coordinator to identify another vendor who does. Verify the Government’s tax exemption or discount status with vendor prior to payment or at the point of sale. Verify that all CBAs are not assessed taxes and in the event the taxes are assessed, notify your program coordinator (A/OPC). Should there be a fraudulent charge on your account, initiate the dispute process within 90 days of the purchase. Maintain copies of all receipts in order to verify taxes assessed. Monitor your account activity frequently to identify any instances of fraud, misuse, or state tax assessment. Keep a record of exemptions and transactions, which include dates, vendors and taxes. What is the GSA SmartPay Fleet Account? Use of GSA SmartPay Fleet Accounts enable agencies/organizations to conveniently obtain fuel and maintenance for vehicles and equipment, as well as manage tax recovery efforts and collect detailed fleet management data. All GSA SmartPay Fleet Accounts are centrally billed (CBA) and should be exempt from state tax assessment. US Government Rental Car Agreement Number 4 states that the government may receive tax exemption for centrally billed accounts if there is prior coordination between the account manager and the rental car company. Therefore, agencies should seek tax exemption when using a centrally billed card. This exemption must also be documented in the rental agreement. Although individually billed accounts are not mentioned in US Government Rental Car Agreement Number 4, travelers should work with the rental car company before they travel so they can receive sales tax exemption in the 11 states which exempt IBA cards. Verify that all CBAs are not assessed taxes and in the event that taxes are assessed, contact your fleet manager immediately to initiate the reclamation process as soon as possible. Should there be a fraudulent charges on your account, initiate the dispute process within 90 days of the purchase. Keep a record of exemptions and transactions, which include dates, vendors, and amount of taxes charged. A convenience fee is a flat fee added to the cost of a transaction that a cardholder is asked to pay. For example, a merchant may charge a convenience fee of $5 per charge/credit card transaction regardless of the total cost. Are surcharges and convenience fees legal? As a result of a settlement between a class of retailers and the brands (Visa/MasterCard), on January 27, 2013, merchants in the United States and U.S. Territories will be permitted to impose a surcharge on cardholders when a charge/credit card is used. However, surcharges are prohibited in many states by state law. Which states are prohibited from charging surcharges? The states of Colorado, Connecticut, Florida, Kansas, Maine, Massachusetts, New York, Oklahoma, Texas, and Utah, which cover about 40% of the U.S. population, prohibit credit card surcharges by state law. Therefore, even though Visa and MasterCard will be eliminating the prohibition against credit card surcharges, merchants in those ten states are unable to impose credit card surcharges since they are illegal under state law. Unless those laws are changed, merchants in those ten states are still barred from imposing credit card surcharges. Note: California has a law, California Civil Code section 1748.1, that prohibits retailers from adding a surcharge when a consumer chooses to use a credit card instead of paying by cash. In March 2015, a federal court found the statute unconstitutional and prohibited the Attorney General from enforcing it. The Office of the Attorney General believes that this decision is incorrect and has appealed that order. However, as of now, the Attorney General cannot enforce the statute. Does the ability to surcharge apply to merchants globally? No. The settlement agreement impacts the rules related to the surcharging of credit card purchases made in the U.S. and U.S. territories only. Surcharging remains prohibited outside the U.S. unless there is a local law or variance that requires merchants be permitted to engage in the practice. If a cardholder is charged a surcharge fee, what action should the cardholder take? A legal surcharge assessed when conducting official business is reimbursable as a miscellaneous expense on your voucher (FTR Part 301-12). The FTR does not list every miscellaneous expense that a traveler might have and which are authorized or approved by the agency. For example: M&IE is $34.50 for day 1 and then the surcharge for one meal is $2 (listed as a separate line item). The same goes for hotels: $120 per night; $15 taxes and $12 surcharge - all listed out separately. If the surcharge is illegal, the cardholder should dispute the surcharge amount with the bank directly. Why would a merchant try to charge customers fees or require minimum purchase amounts? Typically, a merchant will charge fees or require minimum purchase amounts to cover the cost of interchange. Interchange is a fee paid by the merchant’s bank to the card issuing bank for processing the credit card transaction. This fee is generally a percentage of the total transaction amount and is passed on to the merchant through the merchant bank’s fees. What is required for merchants charging surcharges? Prior to imposing a credit card surcharge, merchants must provide a 30-day written notice to Visa and/or MasterCard and their credit card banks or processors of their intent to add a surcharge. For merchants who accept Visa cards, the notification form can be found and submitted by going to www.visa.com/merchantsurcharging. For merchants who accept MasterCard, please go to www.mastercardmerchant.com to post the 30-day notice. After notifying Visa and MasterCard, merchants should notify their bank or financial institution that processes credit cards of intent to impose a surcharge. Each merchant will have to make a decision regarding how the imposition of a surcharge may impact its consumers and the competitive position of the merchant in its market. Merchants will also have to decide whether to apply the surcharge only on certain items, like cash advances, or whether to impose it across the board. Each merchant will have to make its own business decision regarding the use of surcharges. Can a surcharge be imposed on debit or prepaid cards? No. The surcharge may only be imposed upon credit cards, and not debit or prepaid cards. The amount of the surcharge may not exceed the amount of the swipe fee paid by the merchant on the particular credit card. Therefore, merchants will need to know how much a swipe fee is on each card if they intend to fully recoup the full amount of the swipe fee. When is the surcharge applied? The surcharge is applied before taxes (when applicable for government charge cards). Will an account holder know that there will be a surcharge? Yes. A merchant that decides to impose surcharges must post a notice of the surcharge at the point of entry into the place of business, at the point of sale, and on the receipt given to the consumer. Online merchants must post the notice on their websites. The notice of the surcharge must be printed on the receipt. The receipt must also itemize the dollar amount of the surcharge. Will I be exempt from taxes when I travel? Several states exempt federal government employees from taxes with the Individually Billed Travel card. Please select your state on the US State Tax Map to see the exemption status and download the appropriate form, if required. Please note that personal cards should NOT be used, and will never receive tax exemption. What forms or types of identification will I need to bring to receive the exemption in the tax exempt states when using an Individually Billed Travel Card? All forms and instructions are listed on the US State Tax Map under your specific state. As a best practice, please call ahead before booking your hotel, to verify compliance with the state tax law. If your hotel does not comply with state tax law, it is recommended that you chose an alternate hotel. Will I be exempt when using a Centrally Billed Account, such as a GSA Purchase Card? Yes, however double check the requirements for your specific state by going to the US State Tax Map. Will I be exempt from taxes when booking a meeting space? Yes, you will be exempt from taxes when booking a meeting space, since you will be using a purchase account, which is a centrally-billed account (CBA). What should I do if the vendor does not want to exempt me at the point of sale? If they can, please have them call the Department of Revenue for the state, so you may receive the exemption. All of the Department of Revenue numbers are listed on the US State Tax Map. What should I do if I realize I was charged taxes after I returned from a trip? Please call the vendor and see if they can reverse the charge. What other tax reclamation steps may be taken at an agency level? An agency can try to reclaim the taxes by contacting the state taxing authority and seeing if they can file a tax refund claim with either the state or vendor with whom the charge was made. The policy varies from state to state on how claims should be filed and on what paperwork/proof will be needed. Please note that the taxes might have to be reclaimed at a state level, a corporate vendor level, a vendor franchise level, a vendor regional level, or an individual vendor level. When preparing a tax reclamation package, the agency filing will need to have a receipt from all transactions in question showing that taxes were improperly assessed/paid, in addition to some sort of proof of payment of those taxes to the vendor. Each state and vendor may have their own requirements as to what will be needed to reclaim those taxes. What are some best practices for receiving tax exemption when using a GSA SmartPay account? It is most important that you research what is required of that state and contact the vendor in advance. By calling the vendor in advance, you will have the opportunity to pursue another vendor if they choose not to comply with state tax regulations. Call vendors before using your purchase account to ensure you will be exempt from taxes. Please have the GSA SmartPay Support Center number (703)-605-2808 in a safe place so you can call if you have any questions. Remember to check our website before you travel or make a purchase, to see where you will be exempt and what you will need to receive the exemption. What should I tell a vendor if they need to know the proper BIN numbers associated with an IBA or CBA? You can direct the vendors to the businesses and vendors section of the website. If the 6th digit is a 1,2,3, or 4, the account is an IBA. If the 6th digit is a 0,6,7,8 or 9, the account is a CBA. If the 6th digit is a 5, the account is a IBA/CBA (Tax Advantage Travel Account). Who determines exemption status for Individually Billed Accounts (IBA)? The state determines the exemption status for Individually Billed Accounts. Does every state require a tax exemption form to be exempt? No, please check the US State Tax map for specific information about your state. However, you must use your SmartPay account to receive the exemption and have government identification on you. In addition, it always helps to have some form of government orders/ authorization identifying that you are on official government travel. What items should you bring when on government travel? Also, please know the GSA SmartPay website or phone number in case you have any additional questions. The website also has the Department of Revenue numbers listed for all states in case you run into any issues. In an exempted state, is the account holder responsible for county and city taxes as well as other hotel fees (which are included on the bill in addition to the occupancy/lodging tax)? Yes, the account holder will be responsible for paying the county and city tax, as well as other hotel fees, since the exemption only applies to lodging or occupancy tax. However, please check with the state before you travel, since some counties and localities will exempt you from other taxes and fees. Is the Federal Government required to pay the bag tax in DC or Montgomery County, MD with a centrally billed card? No, a state may not assess taxes to the Federal Government on the centrally billed account since the Government is responsible for making the payment, and therefore assessing tax would be a violation of the Supremacy Clause of the Constitution. Which clause in the U.S. Constitution has enabled precedent to be set that states are not permitted to levy certain taxes directly on the Federal Government? The Supremacy Clause states that the U.S. Constitution “shall be the supreme law of the land; and the judges in every state shall be bound thereby, anything in the Constitution of laws of any state to the contrary notwithstanding.” McCulloch vs. Maryland and other court cases have used this clause to set precedent that states are not permitted to levy taxes directly on the Federal Government. Is it illegal for a merchant to photocopy your Government ID? Yes, according to US Code Title 18, Part 1, Chapter 33, 701, it is illegal for a merchant to photocopy your Government ID. If I’m unsure of the specific tax exemption policies for a state, who should I call? Please call the Department of Revenue for that state. Their numbers may be found on the US State Tax Map on our website.